Tomato paste and tomato puree are available commercially throughout the U.S., although home gardeners can also can or freeze these products at home. Both are made from tomatoes, with no added ingredients, but variances in cooking methods result in two completely different products. Use the specified product when possible for best results. Tomato paste is made by cooking tomatoes slowly for several hours, simmering them down to a thick, rich paste. Tomato paste has a sweet, intense tomato flavor similar to that of dried tomatoes. Tomato puree is made by cooking tomatoes briefly to soften them before processing them. Tomato puree has a mild, fresh tomato taste and a thinner consistency. Tomato paste is used in small amounts to thicken sauces or add flavor to stews and soups. 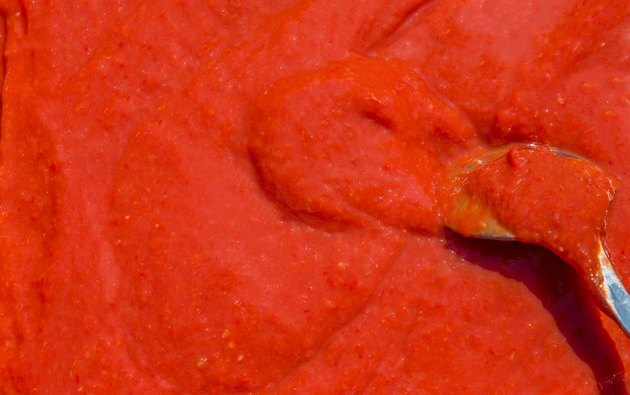 Tomato puree forms the basis of salsas, marinara sauce and pizza sauce. Its mild flavor pairs well with other seasonings and spices. Substitute tomato paste for tomato puree by diluting the paste with water. Mix 1 tbsp. tomato paste with 1 cup water or tomato juice. Tomato puree cannot be substituted for tomato paste because of its thin consistency. Ketchup makes an acceptable substitute for tomato paste, although it lacks the rich tomato flavor and has added sugar. Because of its concentrated flavor, many recipes call for just 1 to 2 tbsp. tomato paste, leaving the rest of the can unused. Instead of throwing the remainder away, place it in a small freezer bag or plastic container and freeze it for up to six months. Leave 1/2 inch of space at the top of the container to allow for expansion. Freeze tomato puree the same way if you have extra. Refrigerate both products for up to five days in covered containers. Barry Farm: What Do I Substitute?